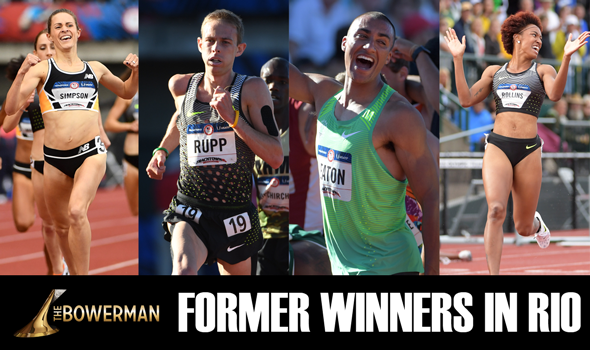 NEW ORLEANS — Since its inception in 2009, The Bowerman Award has gone to an incredible roster of winners starting with Galen Rupp and Jenny Simpson and most recently, Marquis Dendy and Jenna Prandini in 2015. The 14 winners have combined to win several medals on the global stage, notably three of the Olympic variety at the 2012 London Games. The World’s Greatest Athlete Ashton Eaton (2010 Men’s Winner) brought home gold, Rupp nabbed silver in the 10000 and Derek Drouin (2013 Men’s Winner) captured high-jump bronze. Four years later, Drouin, Eaton and Rupp are back for more, while 2014 Men’s Winner Deon Lendore, Prandini, 2013 Women’s Winner Brianna Rollins and Simpson are all hoping for their first taste of Olympic bullion. Here’s a breakdown of each former winner’s chances in Rio, listed in chronological order of when they’re first on the track or in the field. History is not on Simpson’s side, as no American woman has won an Olympic medal in this event. Don’t count out Simpson, though. The former Colorado Buffalo won gold at the 2011 IAAF World Championships and captured the U.S. title in July. Simpson is currently ranked fifth in the world with her time of 3:57.30 that she ran last year. Year in and year out, the 400 is a tough race to handicap on the global stage. No one expected three men to go sub-44 last year at the World Championships, but guess what happened? Lendore is currently tied for 11th in the world rankings and is hungry to make up for 2012, when he failed to make it out of the heats. All three medalists from 2012 are back again, meaning it will take some work to get on the podium. Rupp came through in a big way back in 2012 with a silver medal in the 10000. Right now Rupp is ranked ninth in the world at 27:08.91 in the event, nearly 20 seconds behind world leader Mo Farah. Eight days later, Rupp is scheduled to compete in the marathon. Back in February he had a smashing debut in the marathon with an easy win in Los Angeles. Rupp has his work cut out for himself in both the 10000 and marathon, but if anybody can do it, it’s him. Drouin isn’t a stranger to competing on the world stage. The Canadian started his medal-winning ways in London with a bronze, followed it up with another at the 2013 World Championships, then captured gold in Beijing last year. Drouin is currently ranked in a tie for third, four centimeters behind the leader (Mutaz Essa Barshim). Another medal is likely. Prandini forms a potent combo in the 200 for Team USA with Tori Bowie and Deajah Stevens. The former Oregon Duck is ranked fifth in the world with her time of 22.20. Prandini received valuable racing experience on the world stage last year in Beijing, where she finished 13th in this event. A trip to the finals is likely for Prandini and a medal wouldn’t be out of the question. Loaded doesn’t begin to describe the quality of competition Rollins faced at the U.S. Olympic Trials. Rollins stood tall and won the U.S. title with a time of 12.34. Of the women that made the Olympics, Rollins is the leader and the favorite to win a gold medal. In fact, if the race was run on paper, Team USA would sweep the podium as Rollins, Castlin and Ali are 1-2-3 on the chart. Eaton has been nothing short of incredible on the world stage in the decathlon. "The World’s Greatest Athlete" has won six consecutive decathlon titles dating back to the 2012 World Indoor Championships. Eaton established a new world record last summer in Beijing (9045 points) and is the only decathlete in the 9000-point range. Barring disaster, this should be another coronation for the former Oregon Duck.